This bright, spicy, and medicated side dish is adapted from Joshua McFadden's recipe on Lucky Peach. I love the texture of sous vide carrots because it's sealed in a bag and cooked below boiling, the dish will retain all the vitamins and minerals. So healthy! 2. Seal carrots and butter using a vacuum sealer or with the water displacement method. There might be air bubbles so be sure to have the carrots fully submerged. Sous vide for an hour. 3. In a small bowl, mix fish sauce, chilies, cider vinegar, water, garlic, and sugar. Give it a little taste and add more water if it’s too strong. 4. Remove carrots from water bath, discard the liquid, and slice the carrots in half. Arrange carrots in a serving bowl. 5. Gently toss the fresh greens with 3-4 Tbsp of spicy fish sauce with the juice of a wedge of lemon. 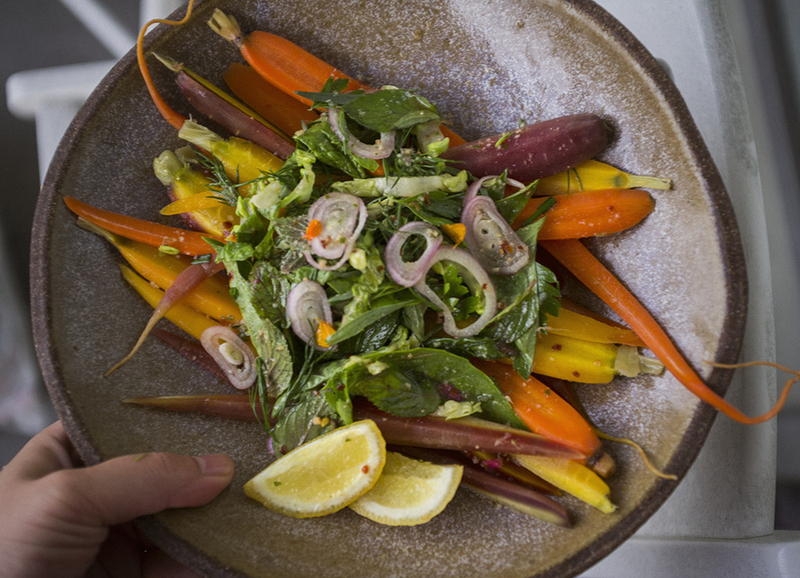 Arrange on top of carrots with a drizzle of olive oil. Serve lemon wedges and the rest of the sauce on the side.